...and from two of the great cartoonists, Carl Barks (top) and John Stanley, who are among the principal characters in my new book, Funnybooks: The Improbable Glories of the Best American Comic Books. That book will be published officially on November 28. According to amazon.com, another book by a great cartoonist, in the oven for quite a while, will finally arrive in my mailbox today. That's Volume 3 of The Complete Syndicated Pogo: Evidence to the Contrary, by Walt Kelly. Its contents: all of Kelly's daily strips and Sunday pages from the prime period of 1953-54. If you haven't already ordered that book, do so now, without delay. 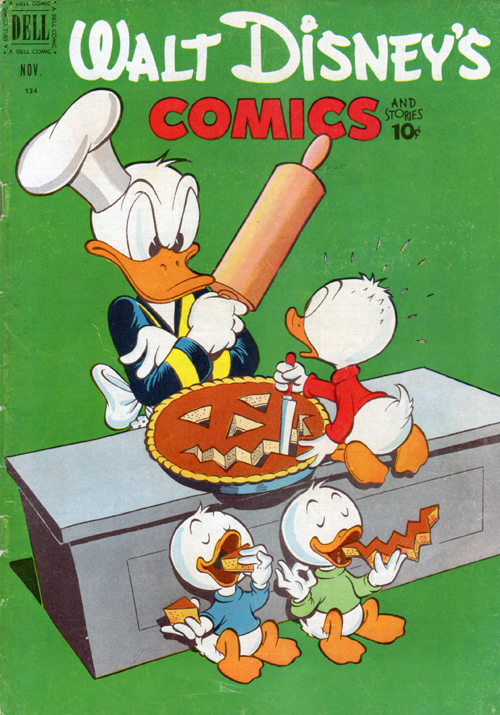 From Garry Apgar: Two questions regarding the Walt Disney's Comics cover you just posted. First: The nephew in blue is about to devour what one presumes to be the two triangular eyes his brother has removed from Donald's luscious home-made pumpkin pie. Duckling number three is about to chow down on the mouth. So where's the nose? Second: Do Donald and his young charges tuck into roast turkey as the main course on Thanksgiving? Surely, Christmas goose is never served in Duckburg. Either way, has PETA ever cried fowl about such matters? MB replies: "Where's the nose" is, I'm afraid, one of those unanswerable questions that consumed the careers of many medieval theologians. The answer to the second question is much easier: yes, as in the story in the January 1952 Walt Disney's Comics, just two months later, and in the November 1952 issue. In both stories, the ducks share the stage with domestic fowl who lack their human attributes, like speech and clothes—and in the January story, they sit down with Daisy for a Christmas turkey dinner. The ducks, it's clear in such stories, are not really ducks at all, but only people who happen to look like ducks. Barks himself sometimes forgot that critical distinction, however, as in two other 1952 issues (the June Walt Disney's Comics and Donald Duck Four Color 422, "The Gilded Man"). In both stories, throughout the first and briefly in the second, he presents the ducks not as people with feathers, but as real ducks who happen to be able to think and talk. I've posted a review of Garry Apgar's important new book, A Mickey Mouse Reader, that also includes comments on a couple of Fantagraphics' newest Mickey Mouse (Floyd Gottfredson) and Uncle Scrooge (Carl Barks) reprint volumes. You'll find that review at this link. The Rescuers (1977) was still in production when Frank Thomas and Ollie Johnston sat for an interview. This photo was taken around that time, as part of the publicity for the film. Wolfgang Reitherman, the director, is at the right, pointing to story sketches. 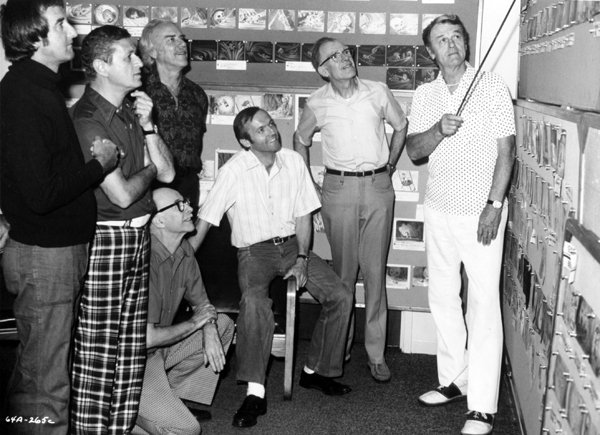 The others are, from left, Dave Michener, Ted Berman, Johnston (kneeling), Art Stevens, Don Bluth, and Thomas. With Milt Gray's help, I recorded hundreds of interviews during work on my book Hollywood Cartoons: American Animation in Its Golden Age. I've wanted to post more of those interviews here, since I think many of them make exceptionally enjoyable reading for people even modestly interested in my book's subject matter. One obstacle has always been the sheer drudgery required in preparing the interviews for publication, especially when they exist only as typescripts and not as computer files, but I think I've found ways to reduce that drudgery to a tolerable level. The first interviews I've prepared under my new regimen are two with the great Disney animators Frank Thomas and Ollie Johnston, the first from 1976 (with Milt Gray) and the second from 1987. I'm posting the 1976 interview today, at this link. The 1987 interview—which I've almost finished editing and laying out for publication here—will follow in a few days. The 1976 interview took place during a long low point in the Disney studio's animation history, a low point memorialized in Steve Hulett's immensely enjoyable series of articles on Cartoon Brew under the umbrella title "Mouse in Transition." The series has reached its eleventh installment; it is supposed to be appearing on a weekly schedule, but unfortunately isn't. Each new installment is well worth waiting for. From Thad Komorowski: Thanks for posting the Frank and Ollie interview, and the promise of the second interview, too. I found it immensely more enjoyable than any of their books precisely because the interview format makes it clear where the words and thoughts are coming from. My problem with The Illusion of Life is not just that it's a doorstop that teaches young animators bad theories and habits, but that it also presents a skewed Disney studio history. Readers aren't aware of Frank and Ollie's biases because they aren't aware of the real Disney history before reading it, and that's done a lot of irreparable harm. A sidebar note: I love how you've used b/w publicity stills as opposed to color framegrabs. It really helps duplicate the feeling that you're reading one of those great '70s film periodicals, like yours, rather than a website. MB replies: As much as I'd like to take credit for reviving fond memories of Films and Filming (and Funnyworld), I must admit that I tend to use scans of publicity stills—when they work as illustrations for an essay or interview—just because they're easier to work with, for me, than framegrabs. From B. Baker: This was a genuine treat to read. Thank you so much. "Gee, Walt, I don't see how you've ever going to get out of this hole you're in. You've built up to the big climax here, and the witch goes over the cliff, and the Dwarfs come back and find Snow White — how are you going to get out of it, what are you going to do?" He says, "Aw, hell, Frank, you don't have to worry about that, you can put in a printed card, or any damned thing." And I said, "Printed card? Gone with the Wind [which was in fact released after Snow White] didn't have any printed cards. Any picture I can think of, they don't use printed cards." If memory serves, there are in fact a number of printed cards in Gone with the Wind explaining various plot developments and transitions. As I've said before, most recently in a February 3, 2012, post, my thought when I read this for a second or third time back in the '90s was, well, OK, if that's the case, why bother? If there are absolute limits to what you can achieve in character animation—if what you're able to do will inevitably seem crude compared with the subtlety of live acting—why not find some better way to spend your time? In the past, there was an obvious answer: fantasy, as presented through hand-drawn character animation, could be more convincing on the screen than the clumsy live-action equivalent. What happens on the screen in Pinocchio is simply more believable than what happens in a live-action fantasy like The Thief of Bagdad or, dare I say it, The Wizard of Oz. In many recent movies, though, computer animation has been used very effectively to sand away live-action fantasy's rough edges. In such movies, the boundary between live action and animation has been all but erased. Because the cool perfection of computer-generated imagery commands belief as even the best hand-drawn animated fantasy never could, the computer has destroyed hand-drawn animation's advantage as a vehicle for fantasy. If, however, you believe with me that animation of the kind that Frank Thomas contributed to the Disney features twenty and thirty years earlier—for example, his fantastically subtle and brilliantly caricatured animation of Captain Hook—is not only missing from all contemporary computer animation but is beyond its reach, you may not be so sanguine about animation's future. From Peter Hale: I think that what Thomas and Johnston were expressing was the lesson, learned quite early on in the studio history, that animation could not imitate the subtlety of live-action on a frame-for-frame basis. In the same way that literal rotoscoping loses the conviction of the live-action, a drawing—especially a simplified cartoon drawing—can't successfully convey all the subtle flickerings of emotion that a real face can. The solution was obvious—it was the route that animation had already taken: pantomime. Just as the drawing was a simplification and a caricature of reality, so emotions registered best when simplified and caricatured. The character animation of the classic Disney films made strong, clear expression of the characters' emotions, instead of trying to underplay them. The acting of Hook, to take your example, would look dreadfully hammy if performed in the same way by a live actor, but is perfectly suited to the exaggerated drawing of the character. In other words, subtle ranges, and changes, of emotions could be conveyed, but only by simplifying and exaggerating the expressions, and the changes, so that they could be clearly read at each stage. I think it is this clarity of expression that makes animation so accessible for young children, who might find subtle live-action performances harder to understand. The later animation, which you find so lacklustre, was merely a refinement of this idea, not an attempt at "real-time" subtlety. Personally, I think the problem with these later films is a lack of story drive, that would force the animation out of its self-indulgence and into greater surges of energy. I suppose it is actually a lack of a Walt, demanding more, and stronger, communication. It's interesting that neither of them picked up on your question about Walt's taste limiting the areas animation went. I suppose it didn't impact much on them, since their concern was with bringing to life sequences that had already been approved. It must have been more of a problem for the story department. From Kevin Hogan: I personally feel that the greatest weakness in animation is in straight human drama. Animation seems to naturally favor exaggeration, and making the impossible plausible. In my opinion, the most successful animated films that are mostly dramatic or “serious” have been films that caricature reality and incorporate large doses of humor (such as The Incredibles). Finding the balance between stylizing reality and making the characters believably mortal has usually proven too difficult. Ex. : Fleischer’s Superman is too stiff to be interesting in animation, Dreamworks' How to Train Your Dragon 2 was too cartoony to be dramatically serious, Hayao Miyazaki needs a lot of special effects animation to make the dully animated humans feel real, etc. I’m not saying that I don’t think it can be done, but I don’t know if anyone has really accomplished the feat yet. Perhaps that is what Frank and Ollie meant. MB replies: In any kind of art, but certainly in character animation of the Disney kind, deciding what to leave out is at least as important as deciding what to put in, but the leaving out should make what we see on the screen seem more complete than would be the case in a more literal rendering. The more industrious an attempt to mimick the subtlety of human movements, of face and body, on, as Peter Hale says, a frame-by-frame basis, the more likely the results will look "crude," to use Thomas and Johnston's word, because the animation will inevitably look more like the product of random selection than of artistic choice. Literal animation of the late Disney kind is one step removed from rotoscoping, the tracing from frames of live-action film, and rotoscoping always fails because it always looks arbitrary, it fails to discriminate. I think caricature and exaggeration are perfectly compatible with seriousness, a couple of ready examples from the fine arts being Daumier and Goya, but it's certainly true that it's hard to think of animated films that combine those elements effectively. On one hand, I took that as a reflection of the studio's long-time belief: Realistic "pretty" people— at least as characters who can carry a film—aren't possible, so give the comedy and the big emotions to the cartoony sidekicks. It was well after the book that we saw central characters who could be realistic pretty and do broad comedy and very subtle acting. Beauty and the Beast has that moment where Belle realizes the Beast is dead; the focus is on her face. Even a few years before, I suspect they'd have given us the back of her head and shoulders, a closeup of hands, or a reaction from Chip rather than attempt that. The prince in Snow White was conceived as a Fairbanksian action hero; it wasn't until Aladdin they could put such a character front and center. Johnston and Thomas simply didn't anticipate a new generation of highly trained artists who essentially started with everything they'd had to invent over a career, plus a climate that would allow full-throttle and expensive pursuit of that goal. On the other, the "magnetism" point could be a reflection of audiences' willfully accepting from a live actor what they simply wouldn't from animation. It's been proven that people will project emotions and reactions onto an actor's face based on context and editing (an actor with a passive expression intercut with a bowl of soup is read as an expression of hunger, for example). Animation certainly draws on context and editing as well, but the character has to meet the audience halfway. This usually means hugely expressive faces and some supporting action. Oliver Hardy could silently reflect on Stanley's latest fumble for several seconds; he could even look directly into the camera. Garbo could stare into space blankly at the end of Queen Christina. While animators are now capable of subtle, minimalist acting, it's still not quite the same. Even with some subtle movement, an audience will slip out of the story and see a drawing while Garbo can remain Garbo all night. A cartoon character, even a serious one, had to be (and still has to, in many ways) be a lot less subtle than Mr. Hardy. Hook isn't letting the audience read his inner thoughts or feelings; he's very actively deceiving Tinker Bell while controlling his evil glee and his annoyance with Smee. While there's certainly subtlety in there, it's within a scene full of activity and some suspense so we're not just reading Hook's face. MB replies: I agree completely with Don Benson's second point, that animation must win audience acceptance of its characters through means that differ from those of live action, orotherwise the audience "will slip out of the story." But the goal in both cases must be, as Carl Barks told me in 1971, to let the audience see what is going on inside the character's head: “Back in the days when I was working there at the [Disney] studio, the thing was to hold a character for as long as you could. Let the public see him think.” To me that means characters must be presented with more than "hugely expressive faces and some supporting action." To use Hook as an example, he is of course "actively deceiving Tinker Bell," but what gives that deceit its comic impact is that Thomas is "letting the audience read [Hook's] inner thoughts and feelings." I can easily imagine the same sequence animated flatly and with no impact at all, but still getting the point across. For me, the only "subtle acting" in Beauty and the Beast is in some of Glen Keane's animation of the Beast himself. Even that accomplishment is diminished by what I suspect were poor directorial decisions, as in the way the Beast breaks character and snaps to attention when his underlings are telling him how to court Belle (forgive me if that description of the scene is a bit off, but I'm sure I've gotten the sense of it right). If the acting in Beauty and other Katzenberg-era Disney features seems subtle, it may be because the cartoony characters, the comic relief, are variously so crude (as with Gaston's sidekick Le Fou in Beauty) or so indistinct (as with the transformed servants) that any sort of refinement sticks out. Adjusting to that new address, after many years with Comcast, has consumed too much time, and this site has gone neglected for too long. I have several things in the oven, including a couple of joint interviews with Frank Thomas and Ollie Johnston from 1976 and 1987, and reviews of some significant new books. Working on this site is very enjoyable for me, especially now that Funnybooks is finished and I need other ways to exercise my writing muscles, so I hope to be back to posting on a semi-regular schedule very soon. 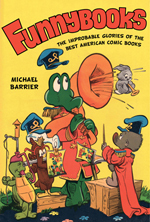 According to amazon.com, the publication date for Funnybooks has moved up about a month, to November 28. The publisher's website is not quite so specific, settling for "November 2014." In any case, the book will be in print (or in pixels, as an e-book) in about a month. Its price remains high for a paperback, I think, and I wish it were a little lower. That may happen yet, at least for purchases through online retailers like amazon, if there are enough advance orders. I am sure there were people in mid-twentieth century America who began reading comic books after they reached adulthood, but there cannot have been many such people compared with the millions for whom comics were among their earliest reading experiences. I was one such child, many years ago; I “read” aloud Walt Kelly stories in Animal Comics to my stuffed animals before I could make out the words. My childhood attachment to comic books was unusually strong. I dreamed of being a cartoonist, and I can remember clearly when and where I first saw many of my comic books, on a newsstand or in a variety store or at a friend’s home, even though my memories of my teachers and classmates have dimmed almost to the point of vanishing. Memories like mine are at once so commonplace and so particular to the person doing the remembering that there can be no point in devoting much attention to them here. What really matters about comic books, especially old comics like the ones from the 1940s and 1950s that are the principal subjects of this book, is whether they repay reading today, and not just by elderly people who want to bathe in nostalgia. Funnybooks: The Improbable Glories of the Best American Comic Books is my answer to that question, and my answer is, of course, yes. A qualified yes, to be sure, since most comic books, from any period, have very little to recommend them. At two times, separated by about thirty years, I devoted hundreds of hours to reading and re-reading old comics, trying to sift out the best of them. The first time was when the late Martin Williams and I were choosing stories to include in A Smithsonian Book of Comic-Book Comics (1982). I made my second and more intensive survey when I was writing this book. In both cases, nostalgia wound up playing no role in choosing stories to reprint in the Smithsonian book or write about in this one. When I was a boy, I read every kind of comic book, as most children did, but the comics that attracted me most strongly, and that I read and re-read, were produced by Western Printing & Lithographing Company and published under the Dell label. 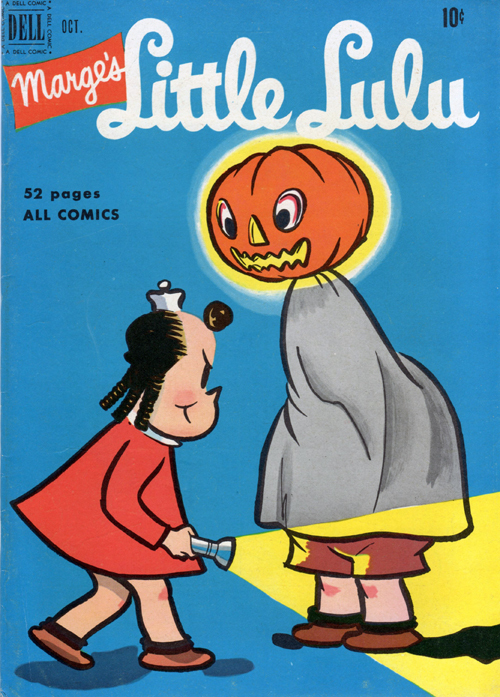 “Dell Comics Are Good Comics” was the company’s slogan in the 1950s. Not every Dell comic was good, by any means, and certainly there were comic books from other publishers that repaid multiple readings; but, in work on this book, as when I was a child, I became aware of how distinct the Dell comics were from those of every other publisher, and how much better the best Dell comics were than almost all other comic books. My initial plan was to cast my net wider, but eventually Funnybooks became a history of the Dell comic books, concentrating on the years before comics of all kinds fell under the censor’s axe and with only a nod to great cartoonists like Harvey Kurtzman and Will Eisner, whose work was for other publishers. Kurtzman and Eisner, and other artists like them, have already been the subjects of books, in some cases many books, but there has been no book like this one. At that, my book is only a partial history of Dell and Western Printing, so there are names missing from the index that many devotees of the Dell titles will expect to find, or to find mentioned more often. But although Dell published the work of many writers and artists who deserve to be admired, it published only a few whose work demands to be read, Carl Barks (Donald Duck), John Stanley (Little Lulu), and Walt Kelly chief among them. That is true, surely. But in the twentieth century, that longing for perfection was expressed not just in a benign form through Superman and the superheroes that followed him, each of them sharing a larger or smaller piece of Superman’s perfection, but also in odious totalitarian ideologies that pursued perfection through mass murder. The longing for perfection is a deeply suspect longing, even when it comes cloaked in the innocent wish-fulfillment that the superheroes have always offered. I have always strongly preferred comic books with characters of a different kind—funny characters most of them, cartoon animals many of them, who on the rare occasions when they aspire to wisdom and power invariably reveal, with comical flourishes, their hopeless imperfectibility. Characters, that is, very much like their readers.